Shorter spacers in the front corrects the factory nose-up rake on JL 2-Door models. Taller spacers in the front corrects the factory nose-down rake on JLU 4-Door models. Requires aftermarket wheels w/ 4.75” backspacing or less – or Offset Wheel Adapters for stock wheels – NOT INCLUDED. Models with plastic bumpers require removal of bumper-to-fender wind deflector/splash guards in order to fit 35” or larger tires. Rubicon Fenders require 2” front & 2” rear bump stop extensions in order to fit 35” tires. Requires 2” Front & Rear Bump Stop Strike Pad Extension Kit (# TF-1959500) – NOT INCLUDED. 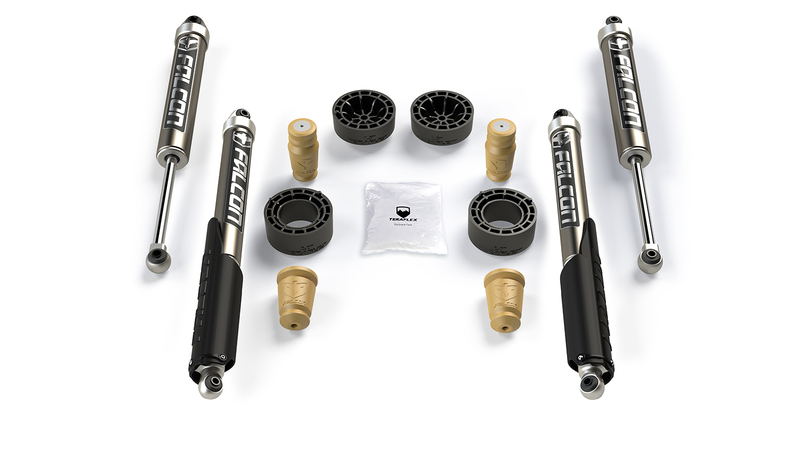 Works w/ original or stock-length aftermarket shock absorbers (not included in base kit) – Falcon shock absorbers recommended.